As poets,our weapons are our words and thats why we gathered at Oxford Book Store on 20/12 to pay homage to the 26/11 terror victims.It was only befitting that we had amongst us someone who had actually gone through the horrifying experience, first hand. We had an interesting group of people -Jamshed Khambatta,ex owner of Nariman House who was thanking his stars that he had sold off the building, Bhishm- a journalist who was In Taj with his mother on 26/11 to addend a wedding reception of his good friend, some new attendees and some of our P4poetry members like Vishvnandji,Parikshit(Parespeare) , Rajshree ,Ruby Malshe and Dr Taher.Unfortunately Vikash and Raj could not attend the meet. We started off with our usual news about the website and also announcing about our tentative poetry retreat and then circulated the mike to every one to share a poem on the relevant theme of terror. Vishvnandji shared a poem that he had written the same morning.Jamshed scribbled something on a pad and shared with us. We had an interesting half an hour discussion which was initiated by Bhishm on the reaction of people to the 26/11 attacks.He felt that everybody was missing the point by either talking about love to combat the situation(jamshed's take) or with a war( Vishvnand's take) or by increasing the security etc. He had missed being killed by a whisker and being stuck in Taj with the terrorists had been a completely cathartic experience for him which we totally understood but we couldnt really understand what he really wanted to do or the reaction that he wanted from people. I guess- as he said-there is no black and white in this world- we need to look at a grey and we left with a very perturbing feeling- What should really be done to combat the worldwide situation? It is such a deeprooted problem- Will it ever be resolved? Will we continue to live in a world of terror? Is that a world that we will give to our children? 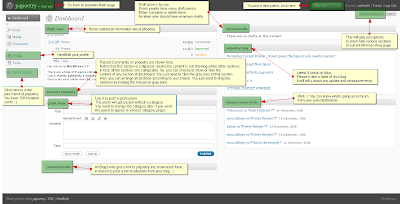 The new dasboard is divided into various sections like 'recent comments', 'recent drafts', 'p4poetry blog' etc. Each section contains an important chunk of information. You can also control, what to see and what now see. Means you can remove a particular section all together. (It is different than collapsing because in this case, you wont even see that particular section). For that, you have one option on top named "Screen Option". And don't forget to pour down your suggestions and feedback. Use the contact page. November Contest Winner - Sonal's poem "Bachpan ki woh meethi yaadein"
The Theme for the November contest was "Childhood Memories/Bachpan ki Yaadein". The response was good and the qulity of entries has improved alot. That just shows how good each poet on www.p4poetry.com is...and they're getting better!! it's SONAL, with her poem "Bachpan ki woh meethi yaadein"! A hearty congratulations to Sonal. Not far behind is Sahilendra who is the runer up for his brilliant poem titled "budhee yaadein"